EUR/JPY pair looks to consolidate further though seen strengthening on Thursday. On the downside, support comes in at the 132.50 level where a break if seen will aim at the 132.00 level. A cut through here will turn focus to the 131.50 level and possibly lower towards the 131.00 level. On the upside, resistance resides at the 133.50 level. Further out, we envisage a possible move towards the 134.00 level. 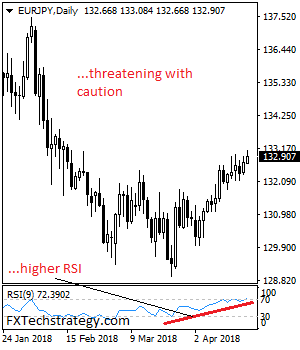 Further out, resistance resides at the 134.50 level with a turn above here aiming at the 135.00 level. On the whole, EUR/JPY faces further consolidation threats.